The iMac (Mid 2006) used an Intel graphics chipset, which used a portion of main memory. Though reported as a 64 MB graphics system, the chipset actually used a minimum of 80 MB of RAM, resulting in a maximum of 432 MB of RAM available for system use in the system. Announced in July 2006, the iMac (Mid 2006) was released exclusively into the Education market as a replacement for the long out-of-date eMac (2005), and much in common under-the-hood with the Mac mini (Early 2006). In order to cut its cost as much as possible, Apple used the cheaper on-board Intel GMA950 chipset, a smaller 80 GB hard drive, and did not include on-board Bluetooth. In other respects, the iMac (Mid 2006) resembled its more expensive iMac (Early 2006) siblings. 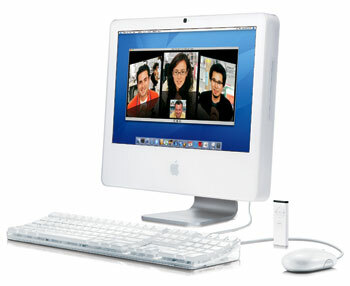 It sold for $899, and was discontinued in September 2006, when it was folded into the iMac (Late 2006) product line.